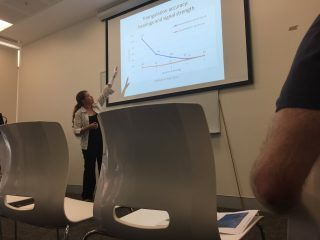 Deb from Wildlife Drones was in town in mid-December 2018 presenting their integrated wildlife tracking system to Department of Biodiversity, Conservation and Attractions (DBCA) wildlife staff, university researchers and some interested private consultancies and mining companies. The Wildlife Drones service offering is a rental arrangement that pulls together drones (or Unmanned Aerial Vehicles), a payload module, radio frequency tags for the animals being tracked, and a base station laptop. 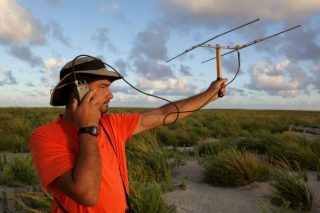 Their unique combination of hardware and software enables anyone tracking animal movements to detect signals and locate tagged animals much more efficiently and effortlessly than ever before. 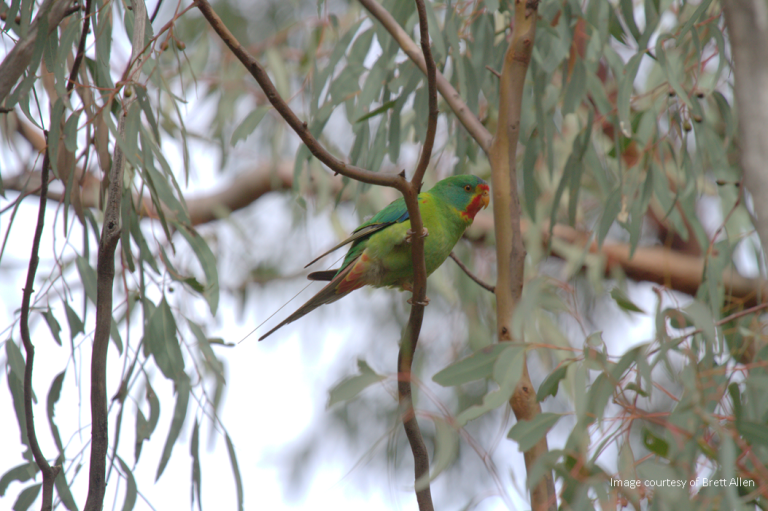 The technology was inspired by a need to understand more about the movements of small, migratory Swift Parrots within their winter range. The Swift Parrot is one of Australia’s priority bird species for conservation action and is listed as critically endangered under the Commonwealth Environment Protection and Biodiversity Conservation (EPBC) Act 1999. Compared to conventional tracking methods, the Wildlife Drones approach has some distinct advantages. Firstly, their system can track up to one hundred individually identifiable animals all at the same time instead of manually tracking one at a time. Secondly, the drone and its payload delivers much more data from a superior vantage point in the air compared to conventional handheld antennae methods. And finally, the base station application that Gaia Resources developed for Wildlife Drones provides on-line and off-line mapping capabilities to visualise incoming radio frequency tags in real time. This includes the ability to download imagery tiles for situations where tracking is happening outside of mobile data range. 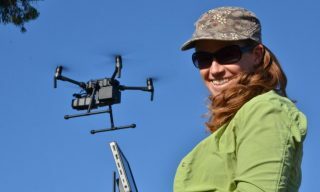 Conventional radio tracking technology (left) and Deb demonstrating the Wildlife Drones method (right). The Wildlife Drones app being presented at the DBCA office in Perth (left), reviewing positional accuracy measurements (right). 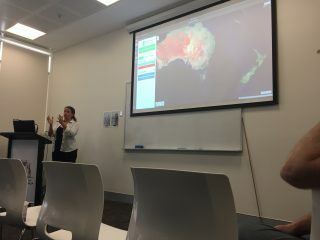 Following the informative morning presentation Deb gave, there were many questions ranging from hardware options to data accuracy and limitations. One, in particular, was around tracking animals whose habitat tends to be in caves and beneath rocky ledges (like the endangered Brush-tailed Rock Wallaby) – and what we found out was that the Wildlife Drones solution is able to collect useful data to triangulate positions from multiple vantage points, meaning that the remoteness and difficult terrain is no longer a logistical constraint for trackers. From the boardroom to the outdoors, we headed out to the West Australian Model Aircraft Sports Centre to see the drone in action. Some tags were randomly distributed in the mini-airfield and surrounding bush, and Deb piloted the drone in a flight path that involved 360-degree rotations in multiple locations around the site in order to triangulate the tag locations. It was also quite windy that day with gusts over 44km/hr, but the stability of the Matrice 210 in those conditions was pretty impressive. The demonstrations in Perth and previously in Hobart have generated a fair bit of interest in the wildlife tracking community, and we are really looking forward to continuing to work with the Wildlife Drones crew in their journey to success. If you are interested in getting a conversation going, jump on our Facebook, Twitter or LinkedIn links– or drop us a line on (08) 9227 7309, or email me on chris.roach@gaiaresources.com.au.